When you think of Dutch flowers, what comes to mind? For many people, it's the tulip! Breck's carries both traditional and unique Dutch tulip bulbs bred to flourish in an American garden. We carry every variety you need to plant spring color in your garden! 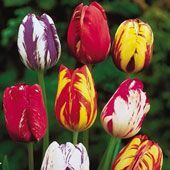 Try classic tulips - we carry many classic Triumph hybrids - or go wild with new and interesting varieties. 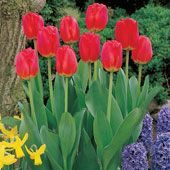 Our ice cream tulips, peony-flowering and double-flowering tulips, and bright parrot tulips are sure to add big, beautiful color to your spring garden. 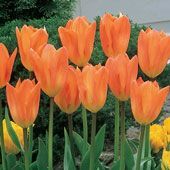 Or, try our Kaufmanniana tulips and other species varieties! With so many tulips to choose from, you're sure to find just the right color - from red to pure white to near-black tulips - as well as the right bloom time. While some tulip varieties bloom in late March, others will open up in May! 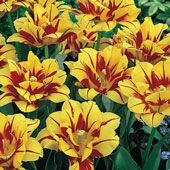 Whether you plant them as garden borders or in row after row of beautiful hues, our Dutch-propagated bulbs produce flowers that draw smiles from all who encounter them. 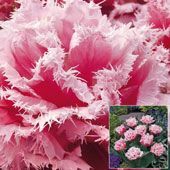 Their dramatic green foliage supports strong, colourful tulip flowers and these perennials return to welcome spring year after year. 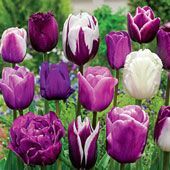 Tulips offer vivacious colour early in the growing season, and with their dramatic hues and so many shapes, these strong plants often serve as the center of attention. 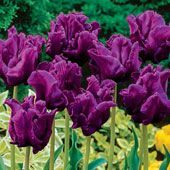 Plant your tulips in rows of a single colour for a carefully curated garden or allow them to surprise you when they bloom in the springtime. Different varieties offer all sorts of options for your garden, so you may choose the sizes, types and shades that work best for your space.